Maurice Merleau-Ponty is my worst enemy. 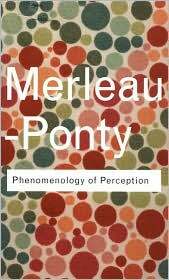 This is the cover of the newest edition of his book, The Phenomenology of Perception. It is terrible. I tried to read the Preface, first and fourth chapters for class last week. I read them, read them again, downloaded some articles on them from the Stanford Encyclopaedia of Philosophy, and even checked out Wikipedia. I still don’t get it. If the Preface were submitted to me as an essay by one of my third-year students in the class for which I am a TA, I would fail him. He does not define his terms. He does not give a clear thesis. He rambles. I do not like phenomenology. I spoke to the prof afterward, asking for some help, and she indicated that it’s normal to feel totally confused. That didn’t make me feel much better. I’ll have another go this week. I don’t have a choice. Maybe it won’t be as bad. Good thing the youngest-ever Chair of Philosophy at the Collège de France was not enrolled in the class for which you are TA! “worst enemy”! them’s fightin’ words! After some closer examination of his work over these past few weeks, I will begrudgingly admit that I now believe there to be something of value in the philosophy that Merleau-Ponty describes in his book. That said, I stand by my assessment of Merleau-Ponty’s writing style. It is terrible. Just because you have a good idea, doesn’t mean you should be able to get away with communicating in an unclear way. I still give him an F.
Oh, and I realise that them’s fightin’ words. I will fight Merleau-Ponty, if I ever meet him. maybe you’ll in the great OK corral in the sweet hereafter for a shootout. he died, as you know, quite young. i’m glad to hear you’ve softened on the ole man, tho. and i quite admit that he does not express himself very clearly. i think the collège de france isn’t really a university; it’s like the french national all-star team, i think.